When it comes time to make to the move into a big bed, you want something with style and function that can grow with your child. The Low Post bed is a great way to make a statement in your child’s room with the versatility to fit any style. The trundle storage unit is a great place for children to store their belongings. It features three drawers to keep clothing, sports equipment, and toys while keeping it organized. The bed is durable and safe for an active child’s lifestyle with rounded corners and steel bolt reinforcements. 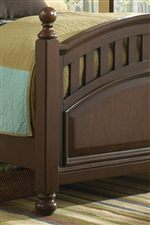 The American Cherry finish will blend with any style and is durable for children of all ages. The Expedition Youth Twin Low Post Bed w/ Trundle Storage by Samuel Lawrence at AHFA in the area. Product availability may vary. Contact us for the most current availability on this product. 8468-630 Poster Headboard 3/3 1 42" 3" 55"
8468-801 Trundle Storage Unit 3/3 1 75" 41" 13"
SLATR-33 Twin Slat Roll 1 39" 75" 0.75"
8468-631 Poster Footboard 3/3 (w/slats) 1 76" 1" 5"
8468-401 Bed Rails 3/3-4/6 1 76" 1" 5"
Finish Finished with American Cherry which is kid-friendly and durable for active lifestyles. Handles & Hardware Hardware is an Antiqued Nickel finish. 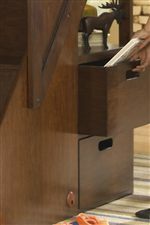 Case Detail Overall molding, framed panels, rounded corners and rounded bun feet on storage pieces. Drawer / Shelf Construction The drawers feature English dovetail joinery. The interior is sanded and sealed to protect clothing. Drawer Suspension Full extension ball bearing side drawer guides. Bed Construction High and low bed rail locking positions to accommodate under bed storage. Slat rolls available eliminating the need for bunky board or box spring. Case Construction Selected veneers with hardwood solids. Screwed in back panels for durability. Expedition provides design, style, and function to youth bedrooms. The furniture is versatile allowing it to work with all ages to make the pieces timeless. 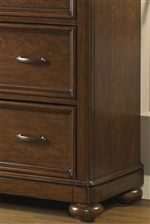 The select veneers and hardwoods are finished with an American Cherry finish that is safe and durable for an active child’s lifestyle. The drawers have English dovetail joinery and are sanded and sealed to protect clothing. The corners are rounded to avoid sharp edges. 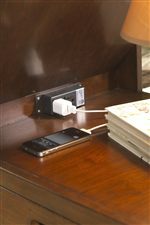 Expedition features a variety of functions with ample storage, shelving, cork boards and outlets to plug in electronics. The collection has a classic feel allowing it to blend with other styles. The Expedition Youth collection is a great option if you are looking for Casual furniture in the area. Browse other items in the Expedition Youth collection from AHFA in the area.